Fried rice is at its most delicious when it's fluffy and not too sticky. It should have distinct, individual grains. Here are tips to help you make fried rice that tastes as good as it does at your favorite restaurant. Long-grain white rice is perfect for fried rice. It cooks up fluffy and not sticky, with individual grains remaining firm and distinct. It all comes down to two starch molecules: amylose and amylopectin. It's the amylopectin that makes rice stickier as rice science says the molecule is highly branched. Long-grain white rice contains a significantly higher amount of amylose (19 to 23 percent, according to the USA Rice Federation) and less amylopectin than other types of rice. By comparison, glutinous rice, also known as sticky rice, is high in amylopectin and contains a maximum of 1 percent amylose. It's preferred when you want rice that will clump together and make it easier to eat with chopsticks. Should You Use Jasmine Rice? Many people prefer Thai jasmine rice over all other types due to its popcorn-like aroma and sweet, slightly nutty flavor. While jasmine is a long-grain rice, it contains less amylose than regular long-grain white rice and cooks up slightly sticky. Basmati rice, which contains a higher percentage of amylose, is a better choice. It is grown in India and Pakistan and also has a distinctive fragrance and flavor. Nonetheless, it all comes down to personal preference. Feel free to use jasmine rice if you like. The amount of water you add when cooking rice will make a difference. 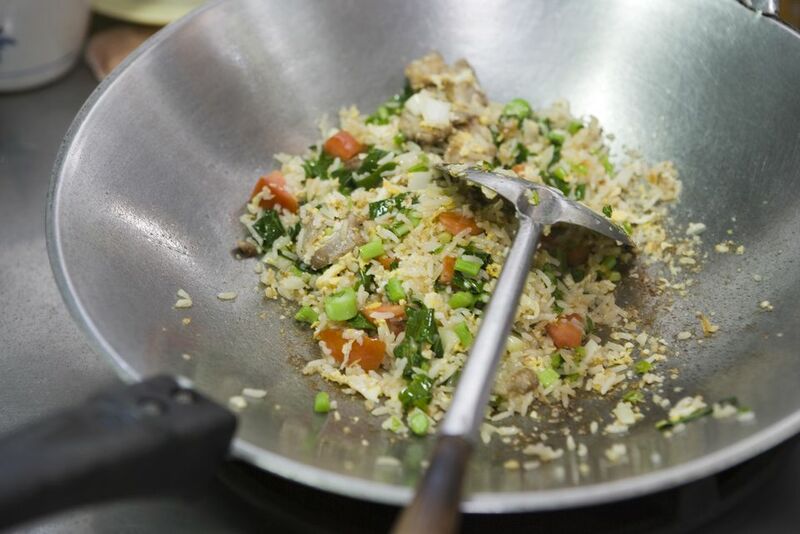 If you find your fried rice is turning out rather mushy, try reducing the amount of water to cook the rice. A typical recipe for cooking long-grain white rice uses a 1-to-1.5 ratio, which means you would add 1 cup of rice to 1 1/2 cups of water. You'll frequently find fried rice recipes calling for cold cooked, previously chilled, or leftover cooked rice. Ideally, the rice you use to make fried rice is cooked at least one day earlier. Day-old rice is drier and reduces the chance of the dish turning out wet and mushy. However, be sure to fluff up the rice before cooling and storing so that it does not harden into a block. However, using leftover rice has its downsides. Bacillus cereus is a spore-forming bacteria that flourishes in starchy foods such as potatoes and rice. It thrives best in warm, moist environments—such as a pot filled with freshly cooked rice left on the stovetop. When using leftover rice, it's important that the cooked rice be cooled down to room temperature and stored in the refrigerator within one hour of cooking (if possible), and two hours at the maximum. Before re-cooking, use a fork or wet fingers to break up any clumps in the rice. And remember, according to the Food Standards Agency, chilled cooked rice should be eaten within 24 hours to be safe.